Beef Bourguignon was historically considered peasant food but has today become a staple in everyday French cuisine. The word “Bourguignon” refers to a recipe that is prepared in the style of the French region of Burgundy. 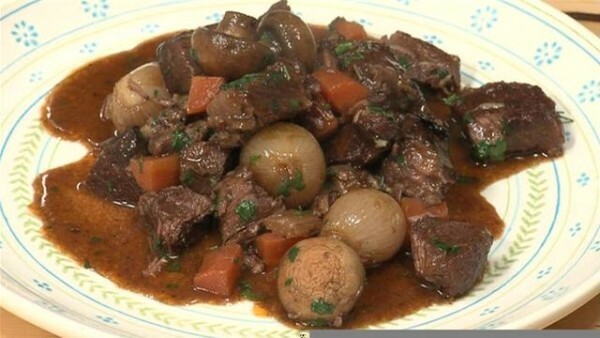 A recipe prepared in the Bourguignon style will feature meat such as beef, which is slowly cooked, almost covered, in red wine with mushrooms, onions and flavoured with bacon or pancetta. The “bouquet garni” used here is a mixture of herbs tied together and cooked with the other ingredients, then removed before serving. 1. Slice x3 shallots and just peel the remaining x5 of them (or slice the large onion and peel the x2 small onions). 2. Plant 1 clove on the end of each of the x5 shallots. 3. Peel and slice the carrots, slice the mushrooms and peel the potatoes. 4. Pre-heat the oil in a deep pan/pressure cooker. 5. On a separate plate, cover it with flour and roll each piece of the beef. 6. Cook the meet on a medium heat until it goes golden (around 2-3 minutes), then remove the meat from the pan. 7. Add more oil to the pan, heat it up and on a low heat cook the diced shallots until they brown and soften. 8. Add the x3 cloves of garlic, mushrooms, carrots and the x5 whole shallots and cook for a few minutes. 9. Add the potatoes and the meat together and reduce the heat to a low/medium simmer. 10. Add the bottle of wine, but so it covers the meat and add the bay leaves and the bouquet garni. 11. Cook on a low heat, covered, for around x3 hours (or x1 hour if using a pressure cooker). Beef bourguignon goes well with mashed potatoes to soak up the sauce. Traditionally however, it is usually served with rice.